To all those disappointed that there’s no golf at the Exchange Cafe this week, good news: there will be a coaching session up at Boughton Golf Club this Saturday! From 12-1pm, children will be able to practice on the driving-range, improve their bunker-play and practice on the putting-green. Cost: £4 per child: no need to book, just turn up! A feast of seasonal, sporting and charitable fun at the Exchange Café on Friday; the Gracie family cake-stall raised a splendid £23.90 for Children in Need, there was some terrific creativity in evidence in the Autumn Crown-making with Miriam Layton, and children really got into the ‘swing’ of things with the indoor golf sessions – an enormous target adorned one end of the hall, and there were several putting mats to add to the fun. Well done to the Gracies for their fund-raising towards a very worthy cause, and to Miriam for her seasonal creativity. The golf sessions will be back in two weeks time. 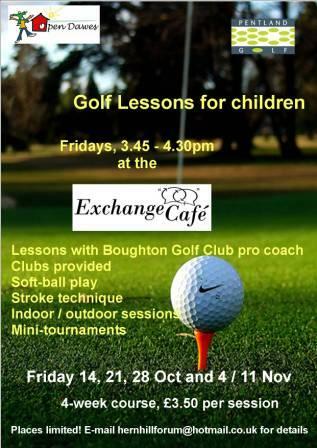 We’re delighted to announce a short series of golf lessons for children on Fridays at the Exchange Cafe! Starting Friday 14 October, Boughton Golf Club will be running lessons for children for a four-week period from 3.45 – 4.30pm on the village playing fields. Coached by one of the club professionals, sessions will include stroke technique, indoor and outdoor play, soft-ball sessions and more. The entire course will cost only £14 (£3.50 per session), and there will be then be possibility of developing them into regular sessions, plus competitions / driving-range sessions at Boughton Golf Club. Places are limited: please e-mail the Forum if you would like to sign up or would like any further details, or contact Miriam Layton.